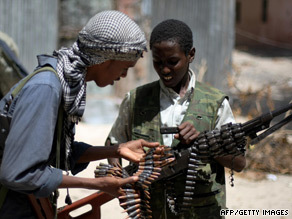 NAIROBI, Kenya (CNN) -- An Al Qaeda-linked militant group waging war against Somalia's fragile government is becoming an increasing threat to Western ally Kenya and could potentially destabilize the region with dire consequences for global security, officials and analysts warn. Al-Shabab fighters count their bullets in neighborhood of Mogadishu. Al-Shabaab, one of the strongest Islamic militias battling for control of Mogadishu, has gained ground in recent weeks, according to officials, and has started to flex its muscles beyond Somalia's border with terror strikes, kidnappings and recruitment drives. Appeals by Somalia's government for international help to unpick its long-running civil conflict have escalated Al-Shabaad's threats with the group behind warnings of an attack on the Kenyan capital, Nairobi. And, say experts, the group is being backed by foreign fighters -- some said to have links to Osama bin Laden's Al Qaeda network -- a situation that draws direct comparisons with the group's influence in pre-9/11 Afghanistan. Mohamoud, whose transitional government has largely failed in its long-term goal of reconciling Somalia's militias, concedes Al-Shabaab is making major gains on his administration and says the global community must act to prevent their threat escalating. "Somalia's problems are not for Somalia alone to solve. Not only for the African Union to solve. It is a global and regional issue. We are very appreciative that the international community understands that, but they need to act now, rather than later." "The issue is not Somalis taking over from other Somalis. But the issue is foreign jihadists imposing their ideas into the region. So Somalia can be a launching pad for a greater and wider jihadist issue." Kenyan government spokesman Alfred Mutua told CNN his country did not yet fear direct attacks from Al-Shabaab but said it was becoming increasingly alarmed about its activities and its links to foreign networks. Despite the concerns, Mutua said the problem was nothing new and while his country struggled to exert control over its porous border with Somalia, it was taking steps to limit the danger. But he warned the threat was not limited to Kenya and could have global reach. "We do believe that Al-Shabaab poses a threat, not only to Kenya, but to all neighboring countries such as Ethiopia and Eritrea," he said. "It is not just a problem that we foresee in Kenya, just because we are neighbors to them, it is a problem that we foresee that may occur to a lot of countries and also poses a threat to outside even this region," he added. "Our concern is not limited to Al-Shabaab. We know that Al-Shabaab are not able to do it without foreign intervention in terms of money and weapons that they are getting from other countries." Ernst Jan Hogendoorn, an analyst with the International Crisis Group, told CNN that while Al-Shabaab had whipped up concerns with headline grabbing acts such as the recent kidnap of two French citizens in Mogadishu and three aid workers on the Kenyan side of the border, countries such as Kenya should pay heed. "I think that Kenya could do a much better job. There is always the possibility that someone could sneak across the border and launch an attack against a soft target. Obviously Kenya has been the target of attacks in the past that are very, very challenging to prevent." But, says Hogendoorn, with an African Union peacekeeping mission in Somalia proving largely ineffective, and Ethiopian military presence withdrawn in January ahead of an Al-Shabaab push, Kenyan military involvement was unlikely to offer any quick fix. "The problem is once [Kenyan troops] are on the ground they open themselves up to guerrilla style attacks and suicide attacks that could lead to significant loss in life."